Wow! Beautiful! It's amazing how you painted it with color pencils! 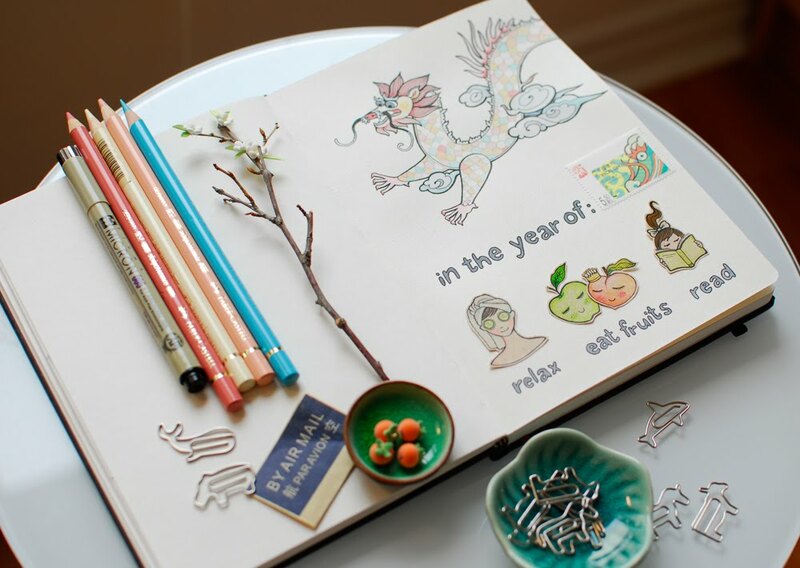 Happy chinese year, I'll try to relax, eat fruits and read lots of books! Happy Chinese New Year to you, too! :) This journal page is AMAZING. I just love your style! Such a pretty post. Happy New Year to you. 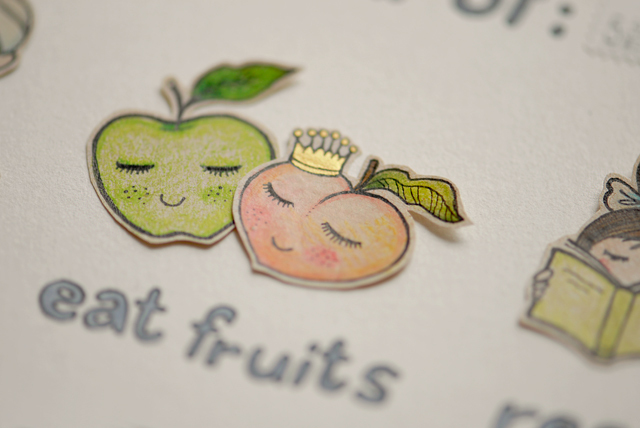 I love the fruits that you drew and also the earrings and teapot! How do you get your polymer clay to look fuzzy like that? You always make such great things, so jealous! Happy Chinese new year to you too! 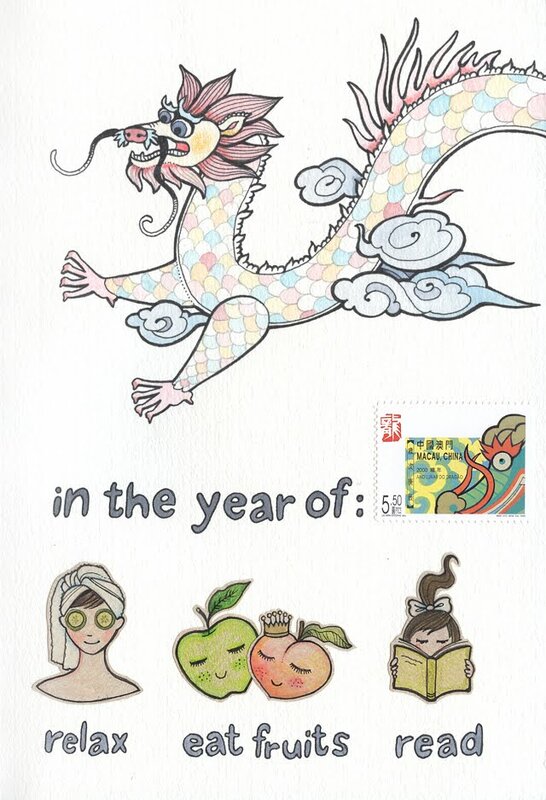 I'm pretty sure I was born in the year of the dragon :) Your little fruit couple is so cute and detailed- and I love those animal paper clips, how sweet! Dearest sweet afi, such a beautiful post!! I adore those gorgeous persimmon beads! Just pretty! Have a lovely merry happy dragon year sweet friend! Love to you! Here in São Paulo, we also had a kind of celebrate! And I love your drawing! ;D Perfect! happy new year! ijust came across your blog and really loving everything in here! 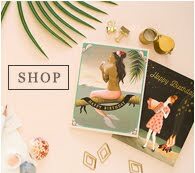 love your work and jewelry! Beautiful dragon and photo. Happy Chinese New Year to you too. i cannot help but love your sketchbook pages. just enough collage and paint and you still leave some pencil and just plain ink. i used to swear by the micron 005, have you tried the Pilot g tec c 0.25? a little less waterproof, but such a nice rollerball, you never have the old micron pen breakdown. i used to buy one every week! Amazing! I'm without words. Simply fantastic!